This story was originally published on May 31, 2018. 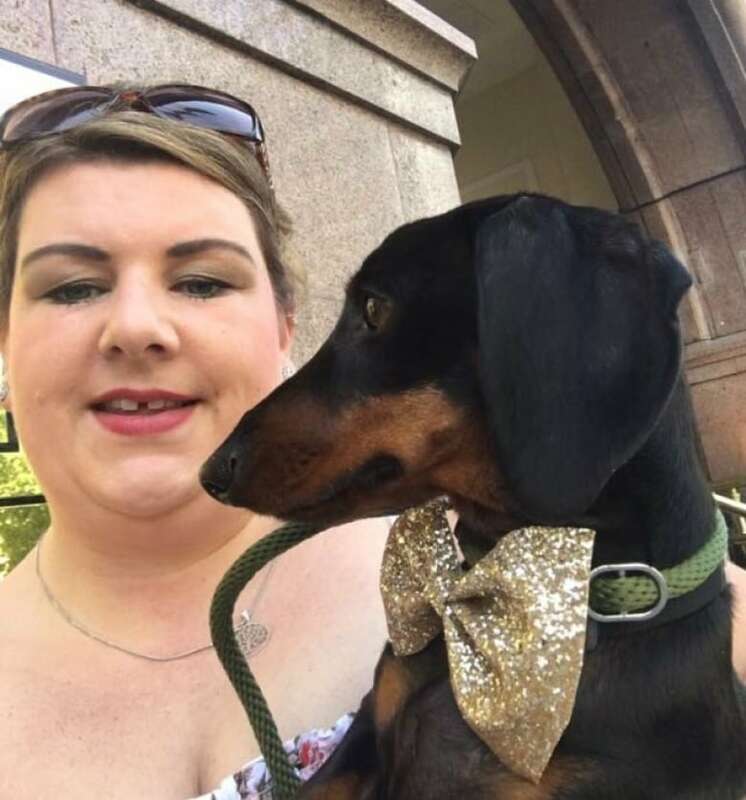 Jessica Jennings says her pet dog Trevor transformed from a regular dachshund into "one big blob" in the time it took her to eat breakfast. The Warrington, England, woman was having a bite to eat one morning earlier this month when her mom piped up: "Does Trevor look fat to you?" At first, she said she didn't think much of it. 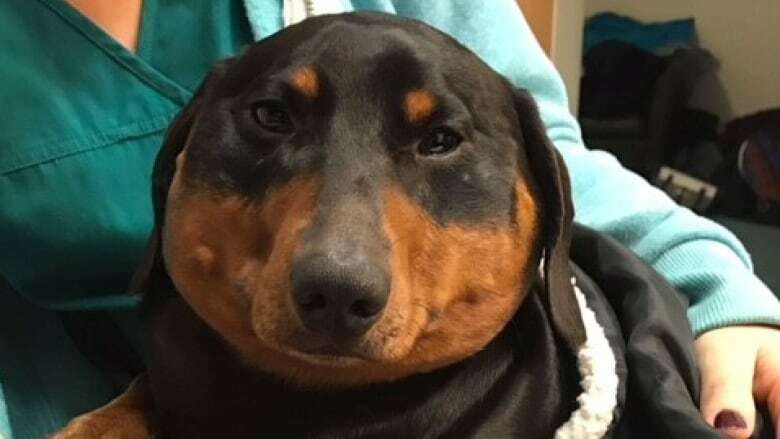 But during the course of her meal, she said the wiener dog kept "getting bigger and bigger" until he was three times his usual size. "Before we knew it, his head and his body resembled one big mass," Jennings told As It Happens host Carol Off. "He literally looks like a seal. He had just blown up like a really, really large balloon. There was no definition of where his head, his neck, his body, his legs, where any of it started." What's more, the usually energetic and chirpy pooch, who likes to chase around the family's chickens, was quiet and immobile. When they touched him, Jennings said, "he felt like bubble wrap, because he was all sort of crinkly underneath." They rushed their beloved family pet to the vet, where it was discovered he had a hole his windpipe causing subcutaneous emphysema, a collection of air under the skin. "Every time he took a breath, some of the inhaled air escaped through a hole in his windpipe around the muscles and fatty tissue under the skin, and X-rays showed the emphysema was worsening," veterinarian Michelle Coward of the Willows Veterinary Group said in a written statement. "Surgery was the only way to repair the injury, but due to its location, there was a significant risk of complications." But they had to act fast because the build-up of air was putting pressure on Trevor's heart. The team stitched up the hole in Trevor's windpipe and left a small nick on his skin for the excess air to escape. "We had to start from his bottom and work our way up to his head and neck and gently squeeze the air out of him just to deflate him," Jennings said. "He was dead happy. I think it was more of a release for him." The procedure was a success. "When he came back for his check-ups following the surgery he was very bouncy and happy," Coward said. "He's a great character and everybody loves him. He was a pleasure to nurse." It's still not clear how Trevor ended up with the bizarre injury, but Coward said there will not be any long-term impact on his health. 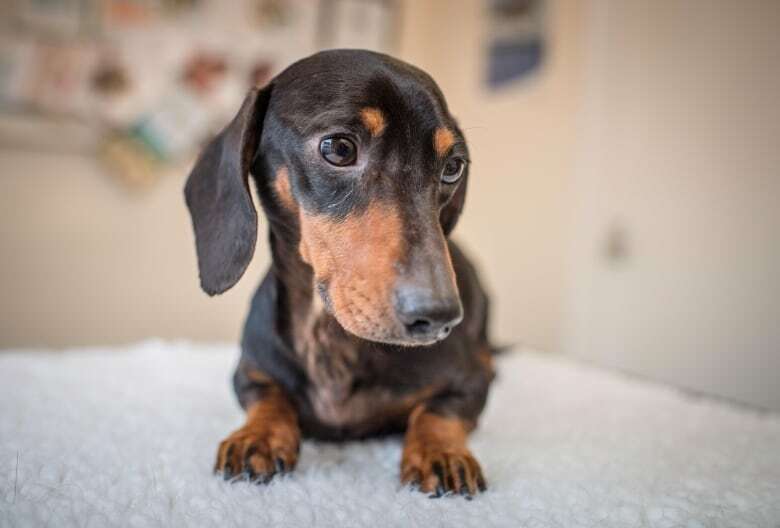 Jennings said Trevor is his old self again — and back to his work as a stud for the family business of breeding dachshunds. "He's back rounding up the chickens and keeping the ladies in tow," she said. Written by Sheena Goodyear. Interview with Jessica Jennings produced by Sarah Jackson.